The sun had set, as we seem to be destined to set with it. We entered through a dark narrow door. Immediately we heard the sound of angels coming from within, spilling into every corner of the room. Then we looked up and knew we had entered a part of heaven. Above, and all around, was the grandeur of art that is unsurpassed in the world. We had entered the Sistine Chapel painted by Michelangelo over a 4-year period, 1508-1512 AD. It not only transformed his life in the process but every life since that has visited it. Visibly depicted are the major scenes from the Old and New Testament. Audibly transformed we experienced those scenes coming in waves from a 75-voice choir with harp and violin. Incredibly humbled by the honor of being at this private concert, the experience of heaven is fixed in my mind forever. The Sistine Chapel is part of the Vatican museum, the second most visited museum in the world. To give prayerful thanks for the opportunity to visit it, we walked to St. Peter’s Basilica, another jaw-dropper. It holds 60,000, can fit the Statue of Liberty in its dome, and is over a football field wide. Immediately to the right above a side altar is Michelangelo’s Pietà, depicting Mary barely holding Jesus in her arms. A priest who celebrated mass there said that he felt like Jesus’ body is being allowed to fall onto the altar during consecration of the Eucharist. The artwork is too overwhelming and numerous to reflect upon here. 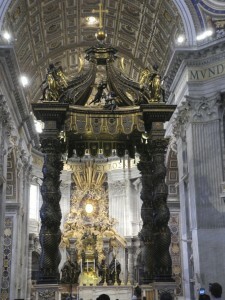 But Bernini’s impact is felt in the canopy over the main alter with twisted support columns to convey a sense of weight. Tradition and strong historical evidence hold that Saint Peter’s tomb is directly below the main altar along with 91 other popes buried below the Basilica. On a sidewall is a list of all the Popes from St. Peter to the present. To assist and give a homily at a weekday mass at a side altar in St. Peter’s was a humbling experience for a mere deacon like myself. St. Peter’s is only one of four local basilicas with 3 others in Rome, the most notable being St. Paul’s Outside the Walls. Tradition and historical accounts hold St. Paul is buried underneath the main altar where archaeologists confirmed the presence of a white marble sarcophagus. For Christians, all of this is holy ground with art, sculpture, music, history, and architecture, to envelope the senses. But does it inspire the soul to serve the poor and the sick, especially in light of the fact that indulgences paid for by the poor where partially used to finance it all? As with any organization run by humans there are dark sides throughout history. Pope Francis physically demonstrated his loving answer to the dark sides and the question of serving the poor. Every Wednesday the pope holds a papal audience. On this occasion there were about 200,000 present in St. Peter’s square, which can hold 400,000. Honored to be there we heard him speak of the importance of serving the poor. When he was finished he went down into the crowd to physically demonstrate that message by first visiting those who didn’t have good seats, the poor among us. Each person he engaged he focused on only them, with a smile and intense interest in what they had to say. Though in Rome to give presentations at the Pontifical University, it was a fortuitous blessing that that same week I was able to attend the installation of 19 new cardinals followed by a Sunday mass the next day concelebrated between them and Pope Francis. Afterward the Pope, as he does every Sunday, gave a presentation at noon with what is called the Angelus or Angel from a window over loud speakers to everyone in St. Peter’s square. Here is what he said: “the vocation of a bishop, a cardinal and a pope is precisely this: to be servants, to serve in the name of Christ. Pray for us to be good servants: good servants, not good bosses!” This echoed a letter he previously sent to the cardinal elect telling them that a red hat “does not signify a promotion, an honor or a decoration; it is simply a form of service that requires expanding your vision and enlarging your heart” and that they should celebrate their new distinctiononly in an “evangelical spirit of austerity, sobriety and poverty”. Indeed there is a new pope in town.